Use the “Study” or the “Explore the Timeline” links in the menu bar above to read historic treatises or to learn about smallsword developments. Escrime Mont Royal (EMR), located at the NDG Community Center in Montreal, offers both modern & historical fencing. Within its approximate 120 members, 21 participate in the Historical Fencing program. 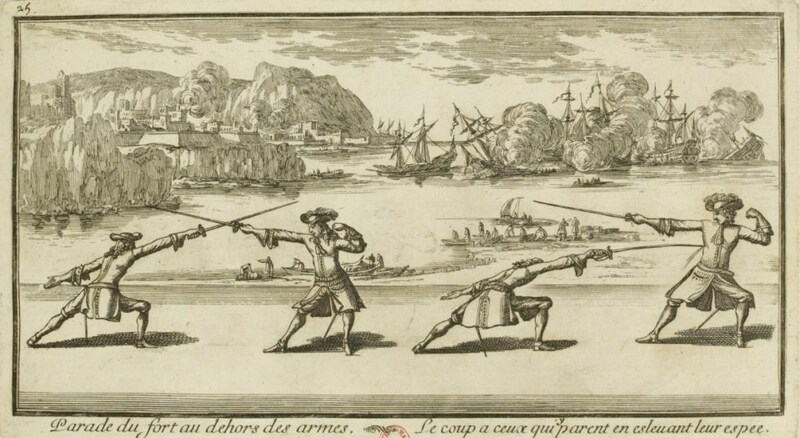 Early French Smallsword is their main weapon; Basket Hilt & French Cane being secondary weapons under study. Kévin Côté is the head Instructor for the Historical Program. Jamson and Crawley have teamed up to transcribe and digitally present a legible edition to McArthur’s 1780 smallsword manual. Crawley states, “McArthur is the most accessible smallsword treatise for starting out yet the least available” so he and Jamson have made it available via the Smallsword Symposium. The SmallswordProject.com mirrors it here with permission to help disseminate McArthur’s work. McArthur, J. 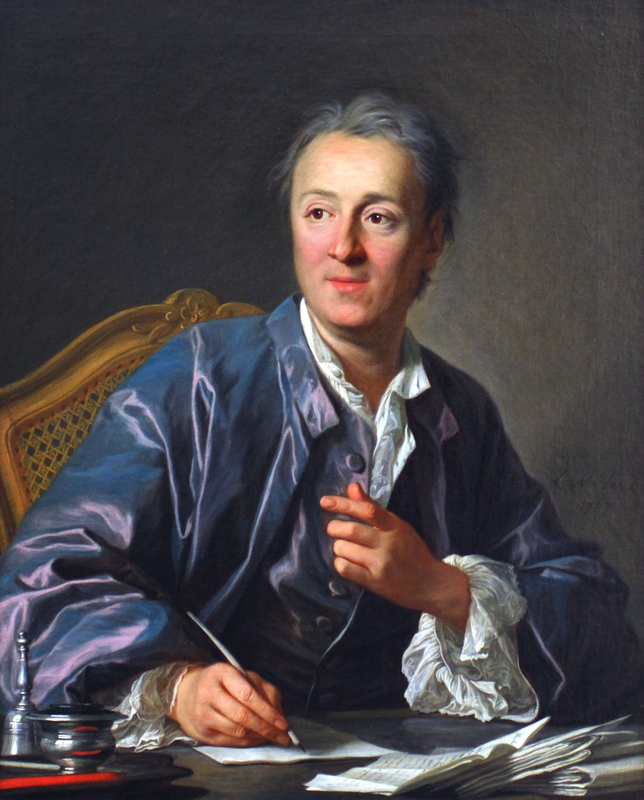 (1780). 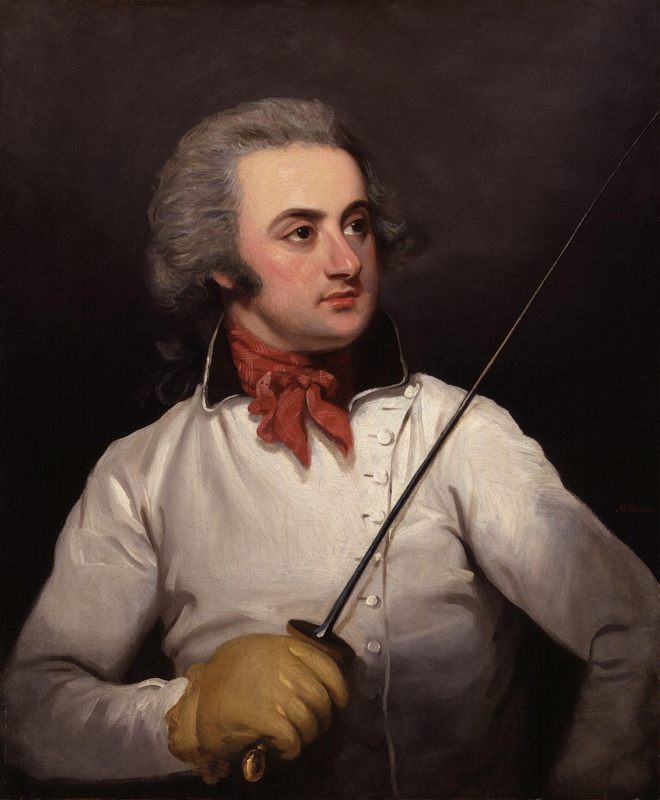 The Army and Navy Gentleman’s Companion or A New and Complete Treatise on the Theory and Practice of Fencing. Displaying the Intricacies of Small-sword Play and Illustrated by Mathematical Figures and Adorned with Elegant Engravings after Paintings from Life, Executed In the Most Masterly Manner Representing Every Material Attitude of the Art A New Addition Revised with a Glossary and Improvements. Download and study McArthur’s text and dozens others published from 1580 to 1880 from our study page. View the antecedents and major developments of smallsword evolution on the timeline. Hanns Osterle, Bladesmith, Nuremberg, 1569. Tempera on parchment. Artist unknown. Courtesy Die Landauerschen Nürnberger Zwölfbrüderstiftung. 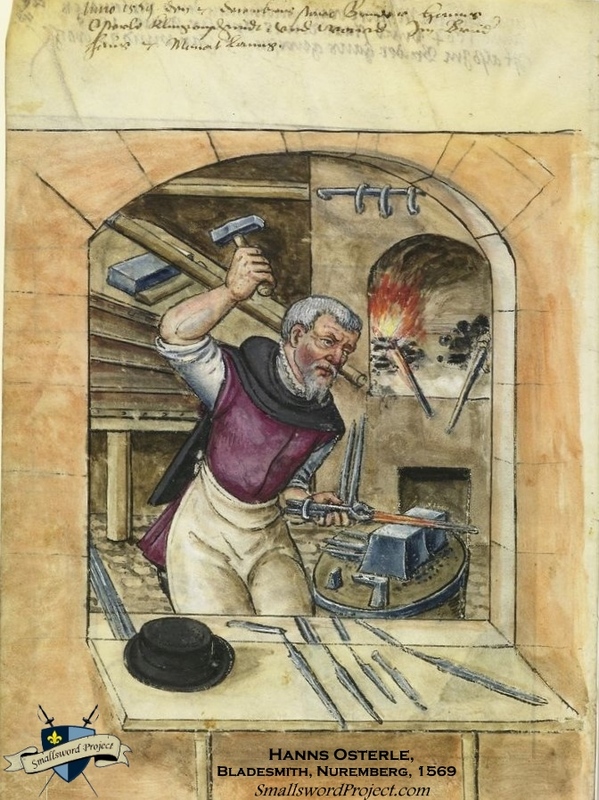 Although rapiers ruled the day and transitional smallswords would emerge a century later, this image of Hanns Osterle, a Nuremberg bladesmith at work in 1569, offers a priceless glimpse into history. Osterle sits in front of his anvil and strikes his hammer on a red-hot blade which he holds with pliers. More blades are in the hearth in the background, on the ground, and on the table. Several blades have tangs and fullers formed. Anonymous, 1569. Tempera on parchment, 298 x 207. Courtesy Die Landauerschen Nürnberger Zwölfbrüderstiftung. Band 1. Nürnberg 1511-1706. Stadtbibliothek Nürnberg, 279.2° Folio 48 verso (Landauer I). The fast and agile smallsword, also known as the court sword, is the culmination of a long and rich history. To view the smallsword’s development in context, explore our timeline. 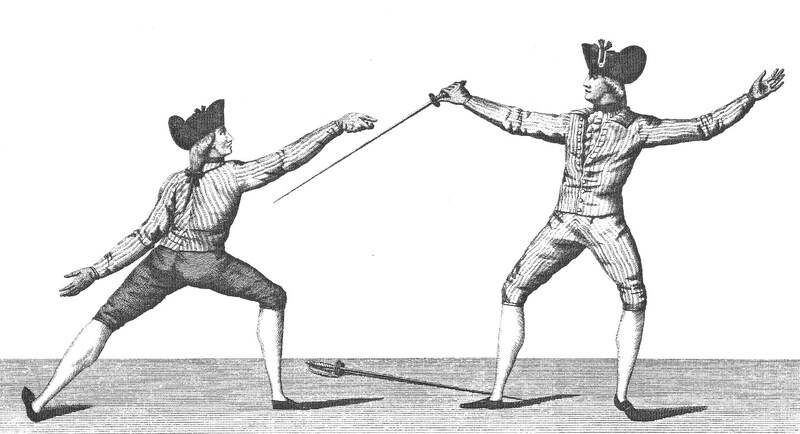 Phil Crawley, Provost with the Black Boar Swordsmanship School and administrator with the Smallsword Symposium, has gleaned these 5 themes of French fencing from a number of 18th and 19th Century texts. They are presented here with his permission, and with our thanks. Aplomb: grounding and thus balance; not only physical balance but also symmetry of posture leading to adroit. Apropros: wherewithal; knowing when and where to apply addresse to maximum effect at an innate level. Adroit: dexterity; being aesthetically pleasing by doing nothing (aplomb) and being graceful when doing something (adresse), as dictated by apropos. 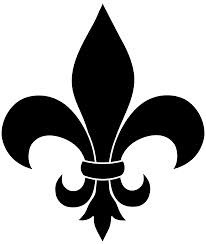 Avoir Main: fencing only with the sensitivity and actions of the hand to determine the intent of one’s adversary and to define one’s own actions.